Where better to pen a magnum opus than inside this magnificent example of Roman a ventaglio (fan) binding? 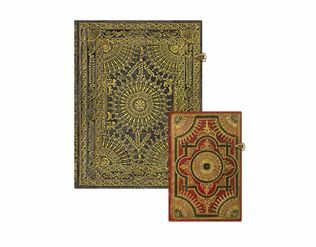 Our reproduction of gilt-work melting over red Moroccan leather shrouds unadorned pages that make space for chronicling events of the day or recording elaborate fictions. Our cover displays at its centre a rose window surrounded by a design of slight Eastern influence and in each corner a filigree fan – the window quartered. An intricate ornamentation typical of Italian Baroque, the geometrically compartmentalized design finds its inspiration in the French style à la fanfare, which gained popularity during the first half of the seventeenth century. Characterized by a celebration of ornate detail, Baroque decoration draws interest to deep symbolism couched in opulence. Watch Paperblanks video of Baroque Ventaglio available now at Jase's Books.